Recto®-Verb™ 1x12 in custom option Hot White Bronco with Black Knurled Knobs, Black Grille and Black Piping. Introducing the Recto®-Verb™ Twenty-Five Head and 1x12 Combo. These are the Reverb-endowed, fraternal-twins of our little Mini Rectifier® lunchbox that’s been taking names all over the globe. These even mightier packages are slightly larger – just big enough to accommodate a 1x12 speaker in the case of the combo and long-spring Reverb tank in the case of the head. In both cases they boast all the same great performance that the Mini Rec™ is famous for and more. Plus, their classic vinyl-covered birch cabinets provide a wide array of custom finish options to fully personalize them. 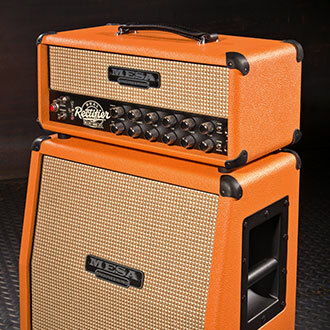 Recto®-Verb™ Head with 1x12 Mini Rec Slant Extension cab in custom option Orange Vinyl, Cream & Tan Grille and Black Piping & Corners. 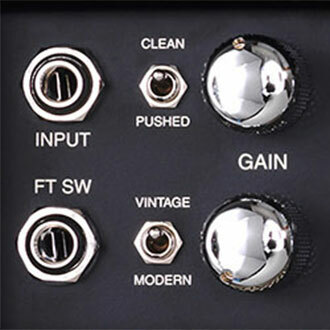 We keep saying it, but it’s hard to overstate the value, effectiveness and stylistic “power” of the Multi-Watt™ Channel Assignable Power switches. These dedicated wattage range choices unveil different power characteristics and colors – so they are really power “voicing” switches as well. In this Recto®, the choice of EL-84 power tubes with their amazing clip characteristics, prompted us to explore the different wiring schemes possible. This experimentation led to the 10-Watt Power Mode being wired for Triode operation. This “more vintage” wiring scheme sweetens and rounds out the sound, turning what might otherwise be a lower volume version of the same voice, into more “soulful” Recto experience. The 25-Watt setting delivers a bold attack, tight tracking low end, increased definition and all out headroom. This setting works great with all the sounds and certainly showcases the mightiness in this little Rectifier®, shocking unsuspecting players and bystanders alike with power and sonic size. 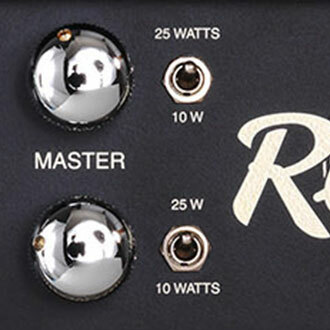 But any time you need to tame this little beast and put a vintage patina of warmth and silkiness around things… kick down to 10-Watts and enjoy a whole new and different world of Recto expression. Channel 1 focuses on rhythm sounds, both clean and overdriven, via the CLEAN and PUSHED Modes. Channel 2 features the iconic Recto high gain sounds in both their faces - The iconic liquid wall of VINTAGE and the aggressive fury of MODERN. Channel 1 focuses on rhythm sounds, both clean and overdriven, via the CLEAN and PUSHED Modes. The CLEAN Mode delivers sparkling, big-headroom rhythm sounds that breathe with rich, warm air on the bottom end. When driven to clip and combined with the 10-Watt Power setting, this Mode misbehaves with real attitude and shines for urgent, yet soulful, Blues solo sounds and furry Rock rhythm. PUSHED aptly describes what to do with the second Mode in Channel 1 and here you’ll find the next region of gain. With a more stripped EQ, and just enough added drive, PUSHED invites aggressive Rock rhythm and Crunch styles to the party and even taunts your mid-gain solo work, especially in the 10-Watt Power setting. Channel 2 features the iconic Recto high gain sounds in both their faces - The iconic liquid wall of VINTAGE and the aggressive fury of MODERN. All-Tube Long Spring Reverb with independent channel controls accessed via the rear panel. VINTAGE excels at thick, high gain chording and single note soloing with an elastic feel and a broad harmonic spread. It has a looser, more organic sound and the overdrive drapes itself around the notes creating a huge, three-dimensional image. VINTAGE solo work is further enhanced by the 10-Watt Power position, were the attack envelope changes and becomes rounder and more voice-like, while upper harmonics recede slightly to create single note sounds of true beauty. VINTAGE and 10-Watt mode compliment each other in ways that will open new doors for the Recto that were previously only available on more well behaved or "cultured" amps. It may also surprise current big-power Recto owners who experience for the first time what this power range/wiring style does for a sound they had typecast. This is a new and exciting face of Recto and it will surely expand its stylistic footprint. MODERN is the opposite in every way. This aggressive Mode comes right at you (maybe even for you) with stunning attack and a hi-mid bump that keeps things percussive and tracking with hyper-accuracy. It's hard to believe that this amount of gain can be infused, yet still deliver with this much speed and definition, especially in bass frequencies. But this is pure Recto and MODERN contributes an equal part to achieving its status as the other most recorded sound in Rock. Needless to say, MODERN is all about all things Heavy and Metal. And while this sound is best demonstrated using the 25-Watt Power setting, be sure not to typecast MODERN too quickly. The 10-Watt Power setting sweetens the mids and softens the attack. It shows another side to MODERN that's more forgiving and vocal, creating a great alternate solo voice with a little more punch and dynamic content. 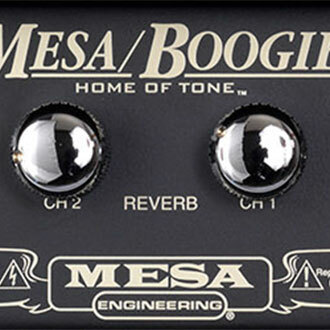 All-Tube Buffered Effects Loop Wired in Series - Mesa/Boogie® invented the concept of incorporating an “FX Loop” into a guitar amplifier decades ago and we’ve worked tirelessly to perfect it. The Recto-Verb 25 features our famous independent channel controlled, all-tube, long-spring Reverb that widen the sound and sweetens the attack, which increases its versatility and appeal for players that use lower to medium gain in their style. The Recto-Verb 25 also features our all-tube, fully buffered Effects (FX) Loop wired in series to provide added flexibility and ease of use – But most importantly, we designed the Loop circuit for TONE! Mesa/Boogie® actually invented the concept of incorporating an “FX Loop” into a guitar amplifier decades ago and we’ve worked tirelessly to perfect it. 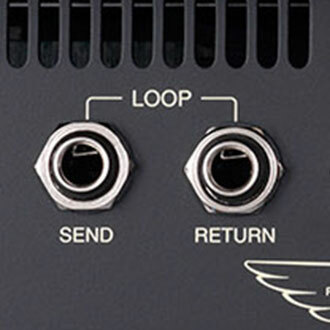 It’s important that the Loop enhances the overall tone of an amp rather than detract. So whether you’re rockin’ out or putting the immense versatility of this new Recto’s four Modes to task on a variety of styles, you’ll find inspiration and a huge fun-factor in these exciting, super-portable 1x12 Combo and Head packages. Experience Tone and Power that far exceed your expectations and completely defies the confines of its physical size. 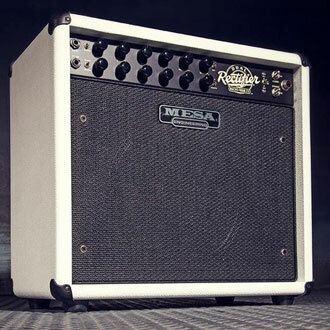 Visit your local Mesa/Boogie® Dealer and get yourself plugged-in to the amazing Recto-Verb Twenty-Five!